A French priest who provided comfort to victims during the 2015 Paris terror attack was hailed a hero after he risked his life by running into the Notre Dame that was engulfed in flames to rescue the Crown of Thorns—a wreath of thorns believed to be placed on Jesus Christ’s head at his crucifixion. 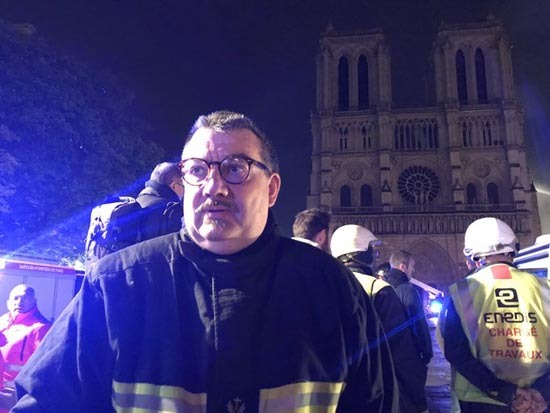 Jean-Marc Fournier, the chaplain of the Paris Fire Brigade, also saved the Blessed Sacrament while he joined rescue workers who entered the iconic cathedral to save the priceless relics on April 15. A photo of Fournier has also found its way to Twitter, with many social media users showing appreciation for what he has done. “Father Fournier is an absolute hero,” a member of the emergency services told an Irish radio station NewsTalk. Fournier has displayed this courage in the past. In 2015, he rushed inside the Bataclan music venue to help the wounded after the ISIS terrorist group launched an attack, claiming the lives of 90 people. The priest is also a veteran of the French Armed Forces and survived an ambush while on duty in Afghanistan, which left 10 soldiers dead. Previous Post: Pelosi denies anti-semitism in the Democrat partyNext Post: West African immigrant attacked for wearing MAGA hat.